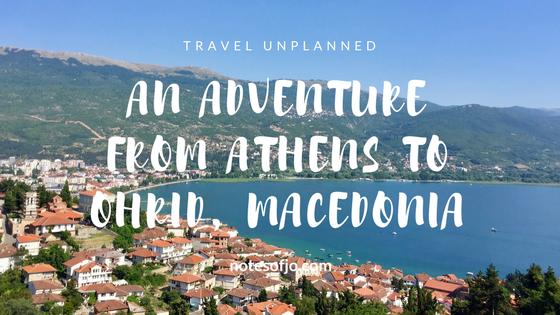 Travelling from Athens to Ohrid, Macedonia was probably one of the more adventurous backpacking experiences I had. 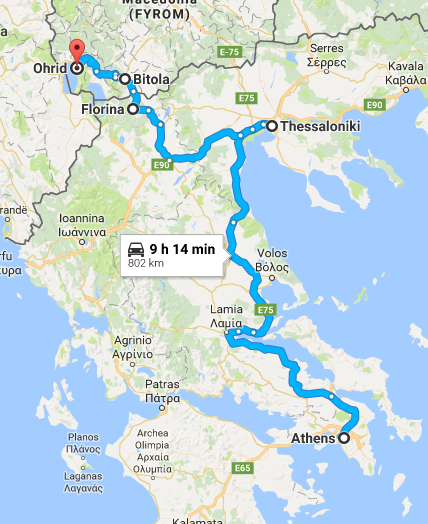 I got on the road unplanned (and without mobile data) except booking a one-way train ticket from Athens to Thessaloniki. Then, I left the rest to the universe! The journey involved two train rides, a taxi ride, a police officer, and a car ride with a complete stranger (!) 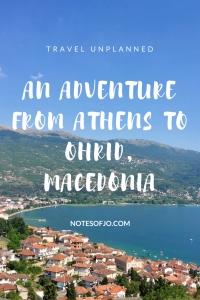 In this post, I am sharing the travel details of how I got to Ohrid from Athens. You can copy my route, but it might not be your cup of tea. Pin it to read it later! Besides that, to be honest, I knew nothing about Macedonia except the capital Skopje was the birthplace of Mother Teresa. I wanted to go to Skopje from Athens but realised there wasn’t any direct trains/buses. I couldn’t arrive Macedonia without going through Thessaloniki! My Couchsurfing host in Athens suggested me to go to Ohrid first because it would be a pity to miss it. And I’ve never heard of Ohrid before that afternoon. I wanted to hitchhike at first, but my Macedonian host suggested me not to due to the rising crime in kidnapping/human trafficking (if I remember correctly.) I tried getting the train ticket in the morning of, but it was completely sold out, so I ended up travelling a day later. Taking the overnight train saved me a night of accommodation. It was 2015, the year which thousands of Afghanistan, Syrian, and Iraqi refugees flooded into Europe through Macedonia. 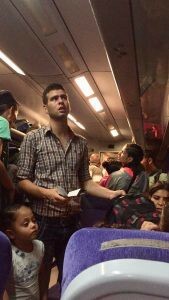 Many of them took the same train, and from their outfits and bags, it was quite clear that they weren’t going on a vacation. The train was noisy, packed, and the toilet was smelly, but I ain’t complaining because at least, I still had a seat and there was air conditioning. I arrived Thessaloniki at dawn and was thinking to stay there for a day or two, but the exhaustion from the overnight ride got me. All I wanted to do was to charge my way to Ohrid. 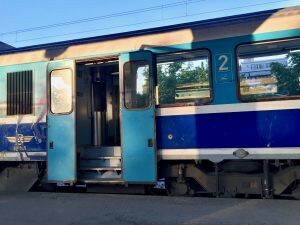 I followed the instruction my host in Athens gave me before I departed and asked the ticket booth for the next train to Florina. From Thessaloniki to Florina was a smooth ride. The short distance local train was pretty empty in contrast to my last leg. My plan was to find a bus that would bring me to Ohrid, but of course, that idea fell through. Florina is a small town at the border of Greece and Macedonia, and the train station was tiny, too. In fact, there wasn’t a “train station.” All I saw was a small blockhouse. I walked in there and asked who I assumed as the ticket agent about how to get to Ohrid, and here came the problem: He could barely understand English, and he has never heard of Ohrid before! At this point, I had already travelled for more than 10 hours. I walked out and looked around but saw no one besides a taxi driver and a police officer. I walked up and asked about how to get to Ohrid by bus. “You want to take the bus? It’s in the centre. Very far away,” the police officer said. Great. I wondered how if there are any other ways I can get to Ohrid. He then exchanged a few words with the taxi driver. “He can take you to Bitola, 14 euros.” That’s a pretty good deal, I thought to myself. How about Ohrid? I asked. “120 euros.” Hmm, that’s a drastic difference. I guess I’ll go to Bitola first, then figure out the rest. I tried to make a conversation with the taxi driver, but he didn’t talk much English. When we were crossing the border, he took down his taxi sign and put it in his trunk. I supposed it’s illegal for him to operate as a cab driver in another country. It was miles of nothing on the way to Macedonia. When we finally made it to Bitola, I gave him 20 euros and waited for him to give me my change. “One more.” He shook the bill I just gave him in his hand. “Fourteen! Fourteen! Pen!” Then he took out a piece of paper and wrote: 40. “Wait, I thought it was four-teen euros! Not for-ty! Can we do thirty instead?” I realised what went wrong here but proposed an alternative. He unwillingly agreed. I couldn’t help to feel bad, but I was on a budget. In the end, he did drive to another country and had to drive back. There were a few buses parked at where the taxi driver dropped me off. An old man walked up to me and said he could drive me to Ohrid. I knew he wasn’t going to do it for free. I saw another blockhouse-looking building and wanted to see if it’s a ticket booth for the buses, but this one was worse than the one in Florina — It was abandoned with no one inside. “How much?” I walked back to the old man. “20 euros.” “Okay, let’s go.” I got into his car. This wasn’t “the car,” but it basically looked the same! His old stick-shift might be as ancient as him, and it was making squeaky sounds when we were driving. 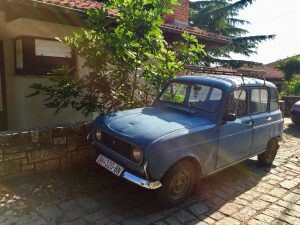 We were going 40km per hour on bumpy, curvy roads with Balkan music blasting through the almost broken radio. Again, I was trying to chat with him to keep myself awake, but that failed also. And there was no way for me to know how long the ride was supposed to take. The ride felt like forever! The man picked up a mid age woman on the road who waved him down when we were closer to Ohrid. It seemed like they knew each other. 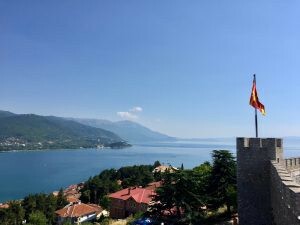 The view from Tsar Samuil’s fortress overlooking Lake Ohrid. The Old Town of Ohrid. 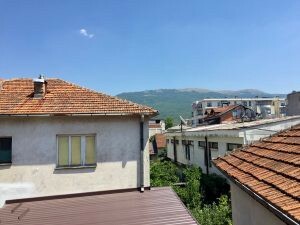 I arrived Ohrid at noon, and it was extremely hot! a few locals approached me and wanted me to stay at their hotels/B&B or whatever it was. I wondered around with my backpack in the city centre and found a hotel lobby that would let me use their free wifi. 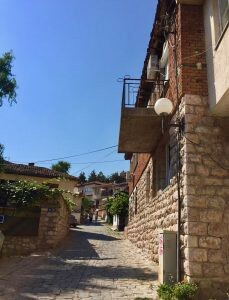 Then I found The Art Hostel Ohrid via Hostelworld. It was a bit far away from the city centre, but that was okay. I went without a reservation and got myself a bed! They didn’t ask me how many days I wanted to stay, and I received the warmest hospitality! And that’s the story of how I travelled from Athens to Ohrid. I travelled 802km and spent a total of 80 euros. It probably wasn’t the cheapest way, but it was an unforgettable experience. And Ohrid is definitely a hidden gem of the Balkans. I had the most pleasurable memories and met some wonderful people there. The town itself deserves its own post, so I’ll save the stunning photos of Ohrid in the next one! If you like my travel stories, leave a comment and let me know! I would really appreciate that. Also, feel free to subscribe! and follow me on Facebook to stay up to date! Originally published at Notes of Jo. Piano teacher, coffee drinker, elephant lover, and foodie! Expat for life. #Travel one city at a time.